The fourth and fifth Monday’s of each month are challenger’s choice at Lens and Pen by Sally’s weekly phoneography challenge. We can choose from Abstraction, Architecture, Food Photography, Night Photography, Portraiture, Still Life, Street Photography, and Travel and this week my selection is Architecture. Bob James designed this holiday star in the mid 1950’s while he was employed as a display designer for a local department store The Bon Marche. 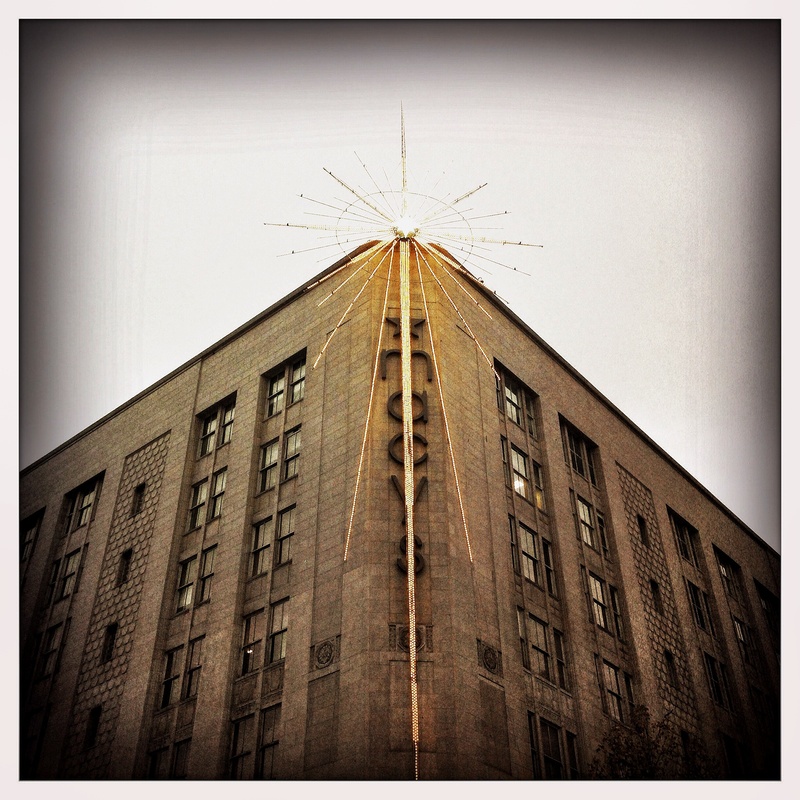 From its beginnings in 1890 The Bon Marche was a Seattle landmark and though the company was purchased and renamed by Macy’s this unique star has survived. 2013 marks its 56th anniversary shining over Downtown Seattle. For those of you who like the technical details this star stretches 161 feet long with 4,300 light bulbs surrounding a 1,000 watt metal halide center. It measures 32 feet across with metal arms ranging from 15 to 35 feet in length. Really like the image and the back story adds to its charm. I like that you got close and the angle leads us to the star’s apex. Happy Phoneography Monday. Thank you Sally. I tried to balance the size of the star and building with my desire to hide the power lines so I got as close as I could without standing in traffic. 🙂 Happy Phoneography Monday to you too. Great perspective on one of our local treasures! Lisa, thanks for a bit of holiday cheer. That must be lovely at night. Thanks Janet, I’m happy to spread a little cheer. And yes it is great to see at night. Festive. I love old star lights like this one. Thanks Andra, the old style ones are my favorite too. I thought the technical specs would be appreciated. 🙂 The whole community was happy to learn Macy’s planned to keep the tradition of the original star and even though the front of the building says Macy’s they also kept the old Bon Marche sign on the opposite corner. Macy’s NYC is probably my wife’s most favourite store in the whole wide world. I cannot let her see this picture. A merry week to you too. 🙂 The star is very pretty at night!